General view of Cladh Hallan. General view of the excavated roundhouses. 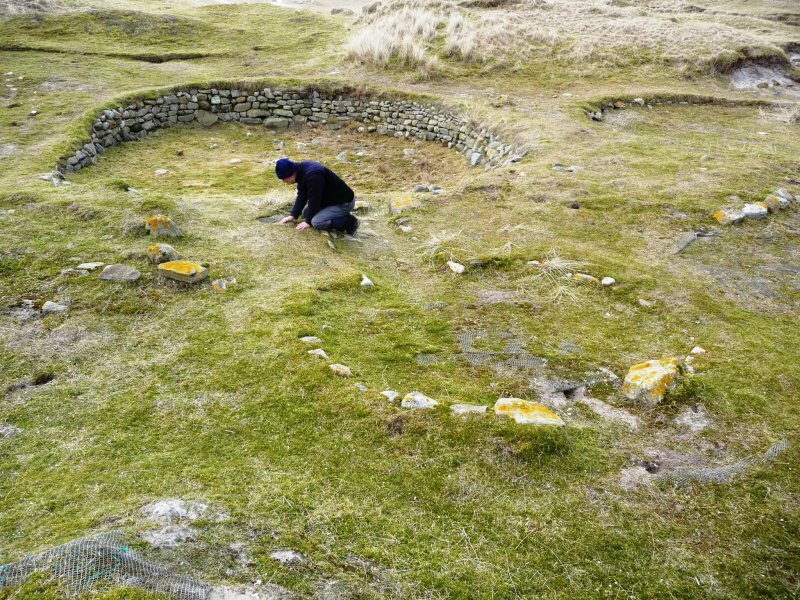 NF 7305 2203 An unusual 'figure of eight' stone-walled house was excavated by Sheffield University W of Cladh Hallan, near Daliburgh, South Uist. Work begun in 1994 was completed in 1995. The house was revetted into a Late Bronze Age midden (dated by a single radiocarbon determination of 2960 +/- 75 bp, and by the presence of coarse, flat rimmed ceramic vessels. The walls of the structure were well preserved on its W side, standing to over 1m. Floor layers were also intact. Bone and shell survive in the machair sand. The E and W ends of the building have been destroyed by quarrying and by wind erosion. Otherwise, the house survives in excellent condition. There is evidence of some stone robbing perhaps in the 19th century but the doorway between the two rooms, with a lintel in place, is well preserved. The small quantity of tumbled stones and the lack of organic material above the floors suggest that the structure was roofed neither with stone nor turf. The floor levels in both rooms comprised a complex and compressed sequence of thin dark layers interspersed with thin layers of windblown sand. Otherwise the only internal features were the claylined stone trough and two post holes, one of which probably provided a central roof support, in the W room and a group of eight post or stake holes, an informal hearth and a low stone bench or footing in the E room. The doorway (0.73m wide) connecting the rooms had an extremely low roof, only 40cm off the ground, yet the floor surface under the door was worn thin from use. Connecting floor layers indicate that both rooms were in use at the same time, with the W room going out of use whilst floor layers were still being put down in the E room. The heaps of sand around the walls of the E room, its lack of a central post and its use for bronze working suggest that it was not roofed. The bronze debris in floor layer 233 included droplets, casting waste and part of a small bronze finger-ring. On abandonment, the building filled up with clean windblown sand. This may well have been a rapid natural event. Amongst the blown sand were small, localised deposits of animal bones and large pottery sherds, from a dozen vessels, mainly coarse cooking wares. 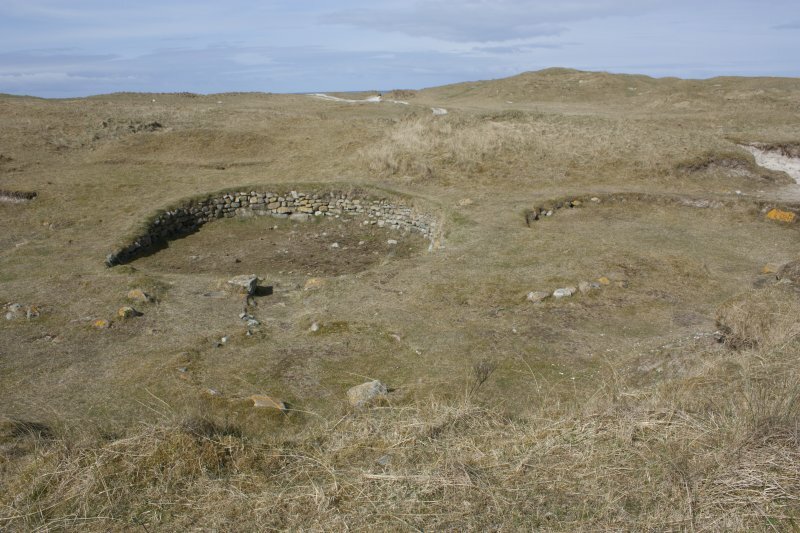 The generally rounded rims are similar to potery from the earliest broch layers at Dun Vulan. They may be ascribed to the Late Bronze Age on the basis of a TL date of 2860 +/- 260 (1170-650 BC). M Parker Pearson, J Mulville and T Roper 1995. NF 733 336-NF 758 140 Almost half of the South Uist machair has been surveyed between 1993 and 1995, in a single stretch from West Kilbride in the extreme S of the island to the N of the Ard Michael promontory, a distance of 20km with the width of the machair averaging about 1km (see unpublished reports, Department of Archaeology, University of Sheffield). Existing RCAHMS records for prehistoric and early historic settlement sites number some 20 locations within this zone. The machair project has now increased this number to 81. Two of the RCAHMS sites, the broch/dun at Orosay (NF71NW 5) and the broch of Dun Ruaidh (NF72SW 7), are misidentifications. The area most responsive to field survey on the machair is the section between Kildonan and Stoneybridge, the N 5km portion of the survey area. Here, where most of the surviving machair plain has not been covered by dunes, some 44 sites have been recognised. along with a grouping of Late Neolithic/Early Bronze Age settlement mounds in the Kildonan area, the main settlement pattern is a set of clusters of Iron Age to Viking Age settlement mounds for each of the five townships. These Iron Age-Viking Age clusters may be viewed as predecessors to the township system first mapped in 1805 and still in use today. A second concentration of sites has been found further S in the machair of Daliburgh and Kilpheder, where a total of 19 sites have been discovered in an area of 3 square kilometres. This density is all the more remarkable given the large extent of dune incursion on to the machair plain in this area. Within this zone two key house sites, both well preserved, have been excavated. One is Kilpheder wheelhouse (NF72SW 1) of Middle Iron Age date and the other is the Cladh Hallan double roundhouse (NF 7305 2203) of Late Bronze Age date. The most remarkable feature of prehistoric settlement in this area is the 500m long string of Late Bronze Age/Early Iron Age settlement W of the modern cemetery. However, there is considerable potential for good preservation, as indicated by the 1994-95 excavations. The results of the recent survey are by no means exhaustive but they do indicate a remarkable density of later prehistoric and early historic settlements on the machair. The pattern of proto-townships throughout the survey area holds reasonably well but there are gaps for the townships of Garrynamonie and Garryheillie. An unusual 'figure-of-eight' stone-walled house (House 112) was excavated by Sheffield University W of Cladh Hallan in 1994 and 1995 (see unpublished reports, Dept Archaeology, Sheffield University). The house's abandonment is dated by TL on pottery to 2860+/-260 bp and by radiocarbon on articulated bone in the same deposit to 2310+/-65 bp. This suggests an Early Iron Age date. The house was revetted into a Late Bronze Age midden (dated by a single radiocarbon determination of 2960+/-75 bp, and by the presence of coarse, flat-rimmed ceramic vessels). In 1996 we excavated more of this midden (Area C) to gain more environmental samples and to cut it back so that some of it could be turfed and preserved. Amongst the large quantities of sherds, bones, shells and carbonised remains was a piece of a clay mould for casting wheel-headed pins. About 5m SE of the midden we found the missing humerus and limb bones of a juvenile, possibly a teenage girl, whose other remains had been found in 1992. Both finds are unstratified. Bones from a second body were interred in 1992 in the modern cemetery. In 1996 we mapped the 600m long NNW-SSE spread of midden with Late Bronze Age/Early Iron Age (LBA/EIA) sherds, at the centre of which was House 112. A hundred metres SE of this there is an active sand quarry (Area A) in which a deep midden and structures are exposed. Within the centre of this quarry we located the upper walls of a large LBA/EIA double-roomed roundhouse (House 401). Its W room has a diameter of 12.1m whilst its E room is smaller, c 4m in diameter. The floor layers survive at a depth of 0.4m below the surface of the midden; the house is filled with a complex deposit of midden layers and sand lenses. As with House 112, there was no trace of internal piers inside the W room. This would suggest that the tradition of pier construction, characteristic of the Middle Iron Age wheelhouses in the Western Isles, did not extend back into the LBA/EIA. To the N of the house, buried 0.2m below the midden's surface, are traces of plough marks running parallel, approximately E-W and spaced c 0.10?0.15m apart. The midden layer is at least 1m deep and probably contains further stone structures. A midden layer above it has been largely destroyed by quarrying. About 30m N of House 112, we investigated stonework exposed within a small quarry (Area B). The stones formed a rough wall which lay over a thin occupation layer. The wall may be part of a badly disturbed house or a rough field or enclosure boundary. A fired clay ball, two flint flakes and an adult human phalange came from this area. NF 764 474 to NF 758 140 The South Uist machair has been surveyed between 1993-1996, from Cille Bhrighde (West Kilbride) in the extreme S of the island to Baile Gharbhaidh (Balgarva) at the N end of the island, a distance of 35km. This year, the number of known prehistoric and Early Historic settlement sites has now increased from 81 to 176. The continuing pattern of Iron Age-Viking Age settlement clusters along the machair supports the hypothesis of 'proto-townships'; that the system of land allotment amongst the townships is essentially an Iron Age phenomenon which survived substantially intact until the Clearances of the early 19th century (see unpublished reports, Sheffield University). An unusual concentration of sites was found at Machair Mheadhanach in the Iochdar (Eochar) area, N of the rocket range and W of Loch Bee; some 35 settlement sites, ranging in date from the Late Bronze Age to the early post-medieval period, are strung out within a 2km line along a NW-SE axis. 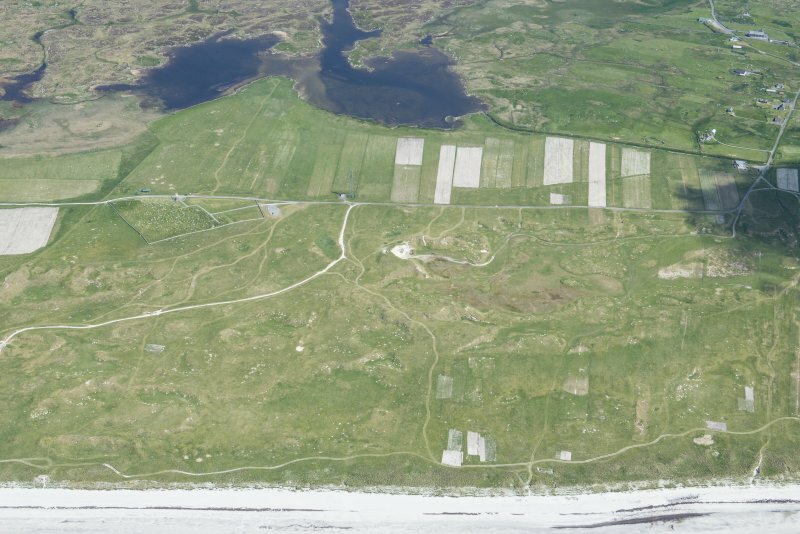 This multifocal pattern is very different from other settlement patterns on South Uist but still fits the 'proto-township' model. The second major concentration of sites is at Drimore where a group of 14 settlement sites, of various dates, are arranged in a SSE-NNW line 750m long. Most of these were identified in the 1950s during survey and excavation in advance of the construction of the rocket range. The pattern of hypothesised proto-townships throughout the survey area (unpublished report, Sheffield University) holds reasonably well but there are gaps for each of the six 'shieling' (gearraidh) townships of South Uist. This suggests that these shieling townships may have formed in the medieval period by sub-division of larger units, and thus do not have prehistoric predecessors. Other medieval peatland settlements are tentatively identified at Upper Bornish, Aisgernis (Askernish), Frobost and Cille Pheadair (Kilpheder). There is a strong possibility that most of the nucleated villages mapped by William Bald in 1805 are located on earlier post-medieval and medieval settlements. The movement of settlement off the machair mainly occurred in the post-Norse medieval period. The only exceptions are Baghasdal, where the machair settlement was abandoned only after 1805 supposedly due to 'machair fever' (James MacDonald pers comm), and Machair Mheadhanach which was deserted some time between 1654 and 1805. NF 7305 2200 Following excavation of an Early Iron Age double roundhouse (House 112) in 1994-95 (Atkinson, Mulville andParker Pearson 1996), another double roundhouse (House 640) was excavated in 1998 along with a 7m diameter roundhouse (House 401). House 401 contained a deep sequence of deposits. Another roundhouse, House 726, lay directly beneath House 401. The centre of House 726 was set slightly to the N of its successor. The detailed sampling of three consecutive floor layers within House 401 linked the sequence of floors to a complex series of wall builds. Finds continued to be copious and unusual, including a copper-alloy disk, a fragment of shale bracelet, a stone loomweight, 14 scapula shovels, 18 antler picks, smashed pots and a disarticulated sheep burial, as well as many bone points, struck flints and pieces of worked pumice. A probable ram skull was found beneath the floor of the entrance. The positioning of House 401 almost directly on top of House 726, and its subsequent continuous refurbishment, hints at a significant longevity of continuity in the occupation of this particular spot. Within this sequence ceramic change from flat-topped to rounded rims suggests occupation straddling the Late Bronze Age to Early Iron Age transition, perhaps over many generations. This practice of living on top of ancestral house foundations and floors may well be part of a significant change within the British Isles away from the Middle Bronze Age practice of relocating new houses at a distance from the old ones. The deep build-up of floors, together with the continuous renewal of walls, indicates that deposition within the house was a long-term continuous process and not an episode towards the end of the house's occupation as a dwelling. The second significant discovery in 1998 was a multi-cellular house, House 640, to the NE of House 401. This was entirely excavated and consisted of an E entrance opening into a sub-circular E room which led into a sub-rectangular W room in the W wall of which were a large niche and a small niche. There was a single small hearth in the E room, the floor on the S side being littered with cooking stones and a broken pot. Although most of the stones in the walls had been extensively robbed, those of the large niche remained untouched. The niche was kept open after the rest of the house had filled with windblown sand, and was used for the setting of a small stone structure before being filled with large burnt cobbles. House 640 provides a useful comparison for the partial but previously unique double roundhouse about 100m to the W (House 112). It also highlights a dichotomy between these two multi-cellular houses and the roundhouse, House 401, in terms of their small size, absence of deep occupation layers and peripheral locations, which seems not to be chronological. The most likely current interpretation is that both multi-cellular and roundhouse architectures were in contemporary usage and were used in different ways, or at different times or by different people. The third discovery was a large depression immediately NE of House 401, filled with dumped material which may derive from the interior of House 401. The results of resistivity survey suggest that this circular depression may be the void left by collapse of a house even earlier than House 401. A further major discovery was the identification of earlier Bronze Age settlement underneath and in the immediate vicinity of the Late Bronze Age to Early Iron Age settlement area. Earlier Bronze Age pottery was found in occupation layers beneath windblown sand below the Late Bronze Age midden and Early Iron Age double roundhouse in Area C. Other probable Early Bronze Age finds were made elsewhere. NF 7305 2200 Excavations by teams from Sheffield, Southampton and Bournemouth Universities continued in an area of c 450m2 (Area A) in the northern part of a large and deeply stratified settlement mound 90m N-S by 80m E-W. Previous excavations had uncovered a double roundhouse (House 640) and a roundhouse (House 401) with a deep sequence of floors and wall alterations (Marshall, Mulville, Parker Pearson and Gidlow 1998). In 1999 House 401 was found to be one of three roundhouses in a N-S line, each of them sharing a 'party wall' in the form of a brown sand deposit which ringed each of the revetted stone house walls and separating the house interiors by 2-3m. This line of houses probably continues under the deep dune which covers most of the site. Ground-penetrating radar survey revealed the presence of anomalies in the central part of the dune but these have not yet been interpreted. The 244 special finds in 1999 include a copper-alloy ring, two bone pins, a bone needle, 30 bone points, a dog tooth pendant, a carved pig's tusk, a wild boar tusk, 18 antlers (mostly picks), 14 scapula shovels, four spindle whorls, a whalebone adze and other whalebone artefacts, polishing, grinding and chopping stones, flaked stone, and worked pumice. This building is remarkable for its extraordinary longevity of occupation and for the variety of unusual deposits within and below its floors. Although the deepest two of the eight floors remain to be excavated, this house has produced a stratified sequence of pottery types which probably spans most of the first millennium BC. In the top layers were vessels with rounded, thickened rims comparable to those found in 1994 in the double roundhouse in Area C about 100m to the NW (House 112, associated with a radiocarbon date of 2310+/-65 bp [AA-17477], c 750-200 BC) and in the earliest levels at Dun Vulan. These overlapped with and were preceded by vessels with flat-topped rims. Earlier in the sequence were vessels with flat-topped but inwardly angled rims. Towards the lower deposits, rims became thickened, concave-topped and almost T-shaped, similar to those from the midden below House 112 (associated with a radiocarbon date of 2960+/-75 bp [OxA-3352], c 1400-995 BC). Because of radiocarbon calibration problems in the 1st millennium BC, the hearths of Houses 401 and 1370 have been sampled for archaeomagnetic dating. Thermoluminescence samples from the site are also being processed. There is another chronological change evident in the stone tools, with flakes of quartz and flint becoming scarce during the house's period of occupation. Dog burials - two dogs were buried beneath the floor, one NW of the E-facing doorway and the other across the doorway. The former was decapitated. A dog's paw was also found in a lower floor layer in the SE quarter of the house. Antler deposits - at least four of the main post-pipes in the entrance area of the house contained near-complete antlers placed in the empty post-pipes where the post had been removed. Antlers were also laid on the floor of the house, especially in its W end where these included antler picks and a large antler 'prodder' or goad. Sheep burials - unlike the dogs, these were all disarticulated and one was a cremation. All but one were placed in pits on the N side of the roundhouse. The other was placed on the N side of a small circular room (see below) to the E of the house, in the side of a storage pit. Cattle scapula shovels - a group of these were found in two pits on the NW side of the house. Smashed pots - these continued to be found only on the southern side of the house. In two cases groups of vessels were deliberately buried in pits on the south-western edge of the floor. A remarkable group is a pair of smashed pots associated with scapula and antler tools, worked bones and worked stone tools lying on the floor in the south-eastern quarter of the house. These may represent an abandoned floor surface, covered over before the next floor above was laid down. Saddle quernstones - until this year there had not been a single find of a saddle quern base. In the centre of the house, within layer 595, a large stone box was located NE of the hearth. Two of its five slabs were from two different, worn saddlestones. During the house's eight phases of occupation its architecture changed radically although the use of space within the roundhouse seems to have remained relatively constant. The entrance consistently faced due E and one of the large doorway post-holes was recut and reused throughout much of the building's use. The S side, and especially the SE part, was consistently full of red peat ash and pottery, suggesting its use as a kitchen and cooking area. The W end has consistently produced special deposits of pottery and antlers. The N side had raised areas, turfed patches and shallow depressions suggestive of sleeping accommodation. The distribution of charred plant remains suggests that winnowing and parching took place in the NE corner. In contrast, the building's shape underwent several changes. It began as a 'heart-shaped' structure with inset doorway and entrance passage. The house was initially linked to the small circular room immediately to its E and beyond the doorway. The purpose of this smaller roundhouse is unknown because its six floor layers were cut through by four later storage pits, but it may have been a storeroom. It had not only an interior stone wall but also an exterior wall forming a small bastion which raised the house above the low ground to the E. Connected to this exterior wall were stone revetments along the external E wall of the main house. By the time floor 595 was installed, the main house was fully circular and the smaller roundhouse seems to have gone out of use. This house had a relatively short occupation span compared to House 401. It appears to have been constructed at the same time but was abandoned after its floor had been replaced only once. Although only its northern half lay within the excavation area, it can be interpreted as a 'heart-shaped' building with an E- facing doorway and a central hearth. As yet, there is no sign of a small circular room to its E. After abandonment its walls were heavily robbed and it filled with windblown sand. Just E of the house, this sand had filled a set of at least six cattle hoof prints made in antiquity. In the layers above this sand were traces of E-W ploughmarks (also prehistoric), with some N-S. There was also a curving gully which appears to have partially surrounded House 401 on its S side after House 801 went out of use. A 1m wide trench was excavated N-S through this structure and the layers above it. The N side of House 1370 lay close to the edge of the settlement mound, the layers of which dipped steeply downwards to the N beyond this house's sand wall. The shape of the house cannot be determined yet but its internal diameter was probably about 6m, similar to the other two. It appears to have had only the one floor layer before being abandoned. Above the thin abandonment layer of windblown sand was a series of thin soil layers which included a floor surface and hearth but with no trace of associated walls. There was evidence for metalworking in this area after the abandonment of House 1370, in the form of small molten lumps of copper alloy and a broken tuyere made of fine clay. Small pieces of metalworking slag were found scattered in various locations across the site. The latest layers across the site were patches of red hearth ash. These may originally have formed a single layer but modern quarrying and erosion have destroyed any possible stratigraphic associations between them. In the northern part of the site, these red ash patches were laid on top of a pattern of E-W ploughmarks which cut into the layers above House 1370. The unusual double roundhouse, House 640 (found in 1997 in the NE part of the site) cut through one of these red ash spreads. 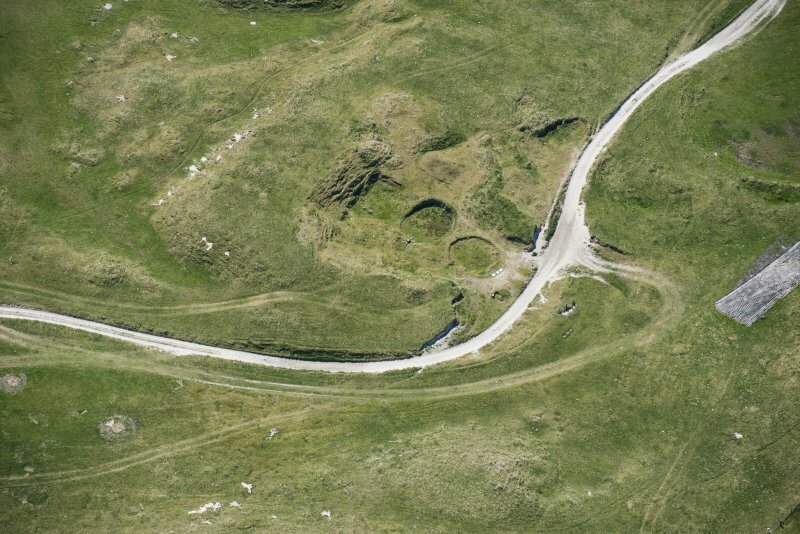 It is thus most probably the latest feature on the site and clearly separate from the N-S line of roundhouses. Subsequently, almost the entire settlement mound was sealed beneath a 2-4m deep deposit of windblown sand. NF 7305 2203 Work continued on the N-S line of three sunken-floored roundhouses and on the yard area in front of them (DES 1999, 91-3). The excavation trench was extended a few metres to the S in order to excavate the whole of the southern roundhouse interior. Above it lay a later house, the N half of which had been entirely destroyed by sand quarrying. The remains of this house (1500) consisted of a central hearth, a floor surface, two stretches of walling (one of which may have been secondary), many post-holes and a pit containing a pot and raw potting clay. There was an unusually high number of bone points from these post-holes. A pot had been buried beneath the W part of the wall, presumably as a foundation deposit before construction. The S roundhouse (801) turned out to be sub-rectangular and in its well-preserved floor were a central hearth, a machair turf spread in the NW, a low earthen 'bench' and stone niche in the S side, and a line of stones which guided movement sunwise into the house. The middle roundhouse (401) has archaeomagnetic dates of c 800-650 and c 900-750 BC for its fourth and fifth floors respectively (out of eight). This year we completed excavation of its third and second floors and began excavation of the first phase. As in previous years we found evidence of hearth ash, pottery and bones in the SE, remnant machair turfs piled up in the NW, and pottery across the S half but almost entirely absent from the N half. There was also a sunken 'cellar' area in the SW corner in the first phase. Under the successive builds of the wall on its SW and W sides we found further deposits of pottery prior to construction of walling. From the fill layer on top of the first floor we found a bronze tanged chisel and an Early Bronze Age flint barbed-and-tanged arrowhead. From the NE corner came a broken bronze tanged blade which had been left on the uppermost of the thin floor lenses immediately before the fill layer was deposited on top. Excavation of the entrance passage and the circular 'porch' area was also completed. The N house (1370) was excavated to the top of its floor layer. Large sherds from several pots had been tipped into a wide pit on its S side. It appears to have had a circular 'porch' and its entrance was 'blocked' after desertion by a pit filled with rubble. Most of its inner wall stones were robbed whereas many of those on the exterior of the earth wall core remained in situ. This house was sub-circular, in contrast to the oval first phase of 401 and the sub-rectangular shape of 801, despite the fact that all three were built together with shared earth wall cores. This information is taken from the account of the excavations at Cladh Hallan published in Discovery and Excavation, Scotland 2001. In August and September 2001, excavations at Cladh Hallan were completed on the terraced row of three roundhouses. During excavation, the preserved floor surfaces at all three roundhouses were sampled using flotation, geochemistry, geophysics and soil micromorphology revealing a standardised and repetitive use of internal space in all three roundhouses. These patterns were similar to those seen at other Iron Age sites in Wessex (the Fitzpatrick sunwise model), with areas for cooking, working bone and stone and sleeping. Within each of the houses a human skeleton was found buried in the NE corner, whilst a fourth was found nearby. Excavation had shown the houses were built contemporaneously, so these interments were probably made around the same time. Disarticulated sheep burials were found within the middle and N houses in the SW corners near the walls. Further deposits recovered from the floors included a scattered deposit of clay mould fragments within the entrance area of the middle house; saddle querns; a gold-plated bronze ring (known as a 'hair ring' or 'ring money'); bronze wire; smashed pots and many animal bones. 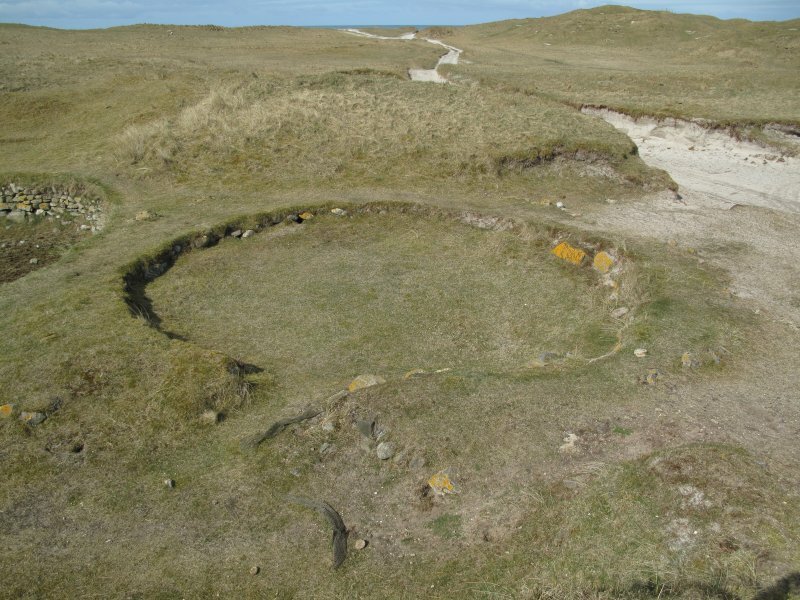 The evidence of metalworking suggests long-distance metal trading connections, as does the gold-plated bronze ring, common in Ireland and known throughout Britain but not in the Western Isles. The remains of a fourth building were identified, and following its abandonment, its ruins were used as a dump for large quantities of dog coprolites, amongst which a bone blade was found. This information is taken from the account of the excavations at Cladh Hallan published in Discovery and Excavation in Scotland 2002. NF 731 218 Excavations at Cladh Hallan in August and September 2002 continued in the same location as in previous years (DES 2001, 102-4). The objective was to complete excavations below the lowest floors of the three Late Bronze Age roundhouses (NF72SW 17). The numerous small pits, post-holes and stake-holes below the floors of the middle and N houses were excavated, together with a row of large pits which were dug underneath - and prior to - the front walls and entrances of the houses. Sections of ground surface beneath the wall cores were also investigated. The sub-floor layers beneath the S house consisted, unexpectedly, of a complex stratified and intercut sequence of four structures, of which the lowest was a Northton-style U-shaped house. This house was built directly on top of a small cremation cemetery with early Late Bronze Age pottery. Underneath, a thick layer of windblown sand covered a Beaker-period ploughsoil which spanned the entire length of the site. 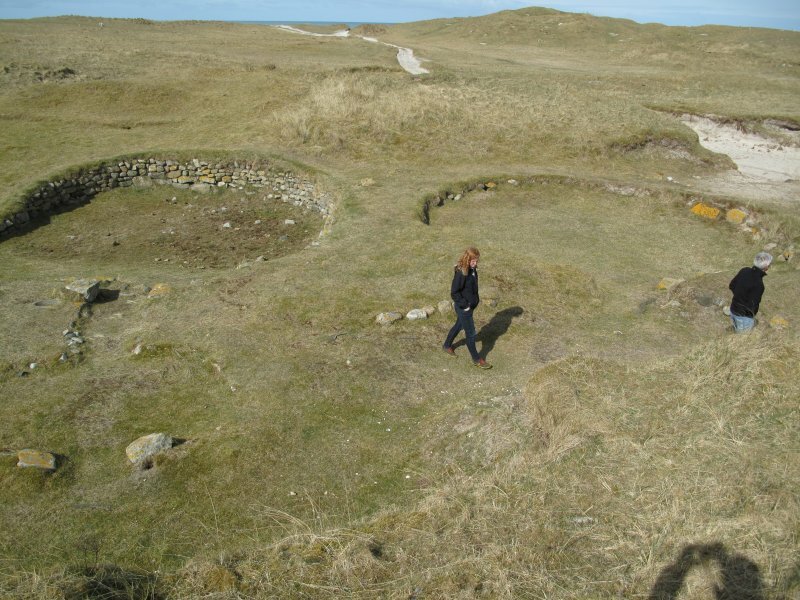 A cluster of three late Bronze Age roundhouses, and an unusual early Iron Age 'figure-of-eight' stone-walled house nearby, are near Daliburgh on the west coast of South Uist. Work at the site begun in 1994 and was still continuing in 2002. This is a ground-breaking project by the University of Sheffield which has succeeded in finding a small settlement, not far from Dun Vulan broch (NF72 1), which dates to the very beginning of the twelve centuries or more of the late Bronze and Iron Ages of western Atlantic Scotland. Until these excavations, only Jarlshof and Clickhimin in Shetland (HU30 1 and HU44 1) and Howe, Pierowall and Bu in Orkney (HY21 6, HY44 8 and HY20 4), had structures from these early occupation levels. These were located in 1996 while mapping the 600m long spread of midden with late Bronze Age and early Iron Age sherds. A hundred metres south-east of this there is an active sand quarry (Area A) in which a deep midden and structures are exposed. 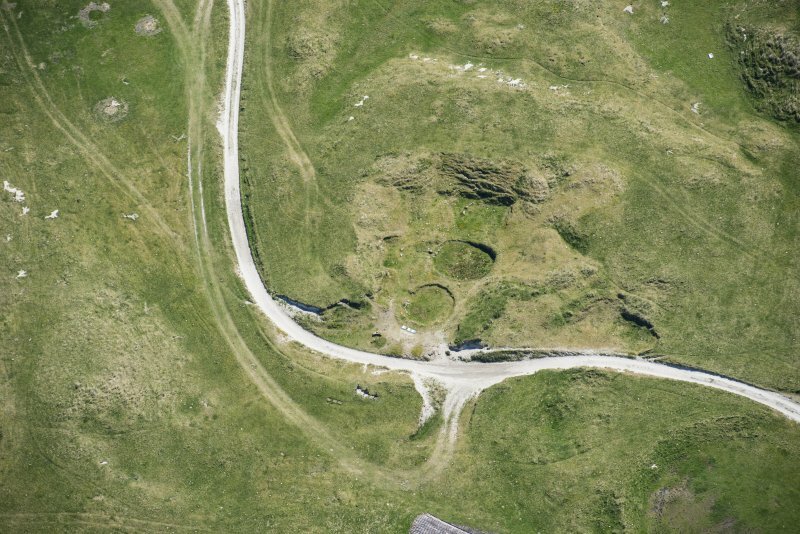 Within the centre of this quarry the upper walls of a large double-roomed roundhouse (House 401) were found. Its west room has a diameter of 12.1m whilst its east room is smaller and about 4m in diameter. The floor layers survive at a depth of 0.4m below the surface of the midden and the house itself is filled with a complex deposit of midden layers and sand lenses. As with House 112 there were no traces of internal piers; the wheelhouses in the Western Isles thus appear to have been a new development in the middle Iron Age. To the north of the house, buried 0.2m below the midden's surface, are traces of plough marks running parallel, approximately east-west. A second double roundhouse (no. 640) was excavated in 1998 together with another single roundhouse 7m in diameter (no. 401) which contained a deep sequence of deposits. Another roundhouse (no. 726) lay directly beneath House 401. The detailed sampling of three consecutive floor layers within House 401 linked the sequence of floors to a complex series of wall builds. Finds continued to be copious and unusual, and included a copper-alloy disk, a fragment of a shale bracelet(extremely unusual in the Outer Isles), a stone loom weight, 14 scapula shovels, 18 antler picks, smashed pots and a disarticulated sheep burial, as well as many bone points, struck flints and pieces of worked pumice. A probable ram skull was found beneath the floor of the entrance. The positioning of House 401 almost directly on top of House 726, and its subsequent continuous refurbishment, hints at a long and continuous occupation of this particular site. Within this sequence the change of the occupants' pottery from flat-topped to rounded rims suggests a time span straddling the late Bronze and early Iron Ages, perhaps lasting many generations. This practice of living on top of ancestral house foundations and floors may well be part of a significant change within the British Isles away from the middle Bronze Age practice of relocating new houses at a distance from the old ones. The deep build-up of floors, together with the continuous renewal of walls, indicates that deposition within the house was a continuous, long-term process and not an episode towards the end of the house's occupation as a dwelling. The second significant discovery in 1998 was a multi-cellular house (no. 640) to the north-east of House 401. This was entirely excavated and consisted of an east entrance opening into a sub-circular east room which led into a sub-rectangular west room in the west wall of which were a large and a small niche. There was a single small hearth in the east room, the floor on the south side being littered with cooking stones and a broken pot. Although most of the stones in the walls had been extensively robbed, those of the large niche remained untouched. The niche was kept open after the rest of the house had filled with windblown sand, and was used for the setting of a small stone structure before being filled with large burnt cobbles. House 640 provides a useful comparison for the partial but previously unique double roundhouse about 100m to the west (House 112). It also highlights the difference between these two multi-cellular houses and the roundhouse (no. 401) in terms of their small size, absence of deep occupation layers and peripheral locations, which seem not to be chronological. The most likely current interpretation is that both multi-cellular houses and roundhouses were in use and in different ways, or at different times or by different people. The middle roundhouse (no. 401) is remarkable for its extraordinary length of occupation and for the variety of unusual deposits within and below its floors. Although the deepest two of the eight floors remain to be excavated, this house has produced a stratified sequence of pottery types which probably spans most of the first millennium BC. In the top layers were vessels with rounded, thickened rims comparable to those found in 1994 in the double roundhouse in Area C about 100m to the north-west (House 112, associated with a radiocarbon date of 2310 +/- 65 bp, or about 750-200 BC : AA-17477) and in the earliest levels at Dun Vulan. These overlapped with, and were preceded by, vessels with flat-topped rims. Flat-rimmed pottery, consisting of small bucket-shaped vessels, was found in a clear late Bronze Age context (8th/7th century BC) in the Covesea Cave in Morayshire (Benton 1931: Coles 1960). Earlier in the sequence were vessels with flat-topped but inwardly angled rims. Towards the lower deposits, rims became thickened, concave-topped and almost T-shaped (this characteristic T-shaped rim has been dated in Sutherland to the early first millennium BC), similar to those from the midden below House 112 (associated with a radiocarbon date of 2960 +/- 75 bp, or about 1400-995 BC: OxA-3352). Because of radiocarbon calibration problems in the 1st millennium BC, the hearths of Houses 401 and 1370 have been sampled for archaeomagnetic dating. Thermoluminescence samples from the site are also being processed. There is another chronological change evident in the stone tools, with flakes of quartz and flint becoming scarce during the house's period of occupation. During excavations the preserved floor surfaces at all three roundhouses were sampled using flotation, geo-chemistry, geophysics and soil micro-morphology and they revealed a standardised and repetitive use of internal space in all three roundhouses. These patterns were similar to those seen at other Iron Age sites in Wessex (the Fitzpatrick sunwise model), with areas for cooking, working bone and stone and sleeping. Within each of the houses a human skeleton was found buried in the north-east corner, whilst a fourth was found nearby. Excavation had shown the houses were built contemporaneously, so these interments were probably made around the same time. Disarticulated sheep burials were found within the middle and north houses in the south-west corners near the walls. Discussion. Since this excavation is ongoing, and since only verbal summary descriptions have been published, detailed comments would be premature. However it is clear that the Sheffield University team have discovered a site of crucial importance for Atlantic Iron Age studies, and one which lies at the very beginning of the whole sequence of stone buildings running from about 700 BC to AD 500. One point which may prove important is that there appears to be no sign in the architecture of the hollow-wall construct-ion characteristic of brochs and no sign of the Everted Rim pottery which appears in Shetland a short time later. Finds. Further deposits recovered from the floors in 2001 included a scattered deposit of clay mould fragments within the entrance area of the middle house [10, Illus. 42]. There were also saddle querns, a gold-plated thick bronze ring (known as a 'hair ring' or 'ring money') [10, Illus. 41], bronze wire, smashed pots and many animal bones. The evidence of metalworking suggests long-distance metal trading connections, as does the gold-plated bronze ring; these are common in Ireland and known throughout Britain but have not previously been found in the Western Isles. Work continued in 2002 and revealed a Northton-style U-shaped house at a low level. This house was built directly on top of a small cremation cemetery with early late Bronze Age pottery. Underneath, a thick layer of windblown sand covered a Beaker-period plough soil which spanned the entire length of the site. The two-roomed, figure-of-eight house (no. 112) was revetted into a late Bronze Age midden, itself dated by a single radiocarbon determination of 2960 +/- 75 bp, and by the presence of coarse, flat rimmed pots. The abandonment of the house is dated by TL on pottery to 2860 +/- 260 bp and by radiocarbon on articulated bone in the same deposit to 2310 +/- 65 bp. This suggests an early Iron Age date, though the flat-rimmed pottery should imply a specifically late Bronze Age date. The walls of the structure were well preserved on its west side, standing to over 1m. Floor layers were also intact and bone and shell survive in the machair sand. The small quantity of tumbled stones and the lack of organic material above the floors suggest that the structure was roofed neither with stone nor turf. The floor levels in both rooms formed a complex and compressed sequence of thin dark layers interspersed with thin layers of windblown sand. Otherwise the only internal features were a clay-lined stone trough and two post- holes (one of which probably provided a central roof support), in the west room and a group of eight post- or stake-holes, an “informal” hearth and a low stone bench or footing in the east room. The 0.73m-wide doorway connecting the rooms had an extremely low roof, only 40cm above the ground, yet the floor surface under the door was worn thin from use. Connecting floor layers indicate that both rooms were in use at the same time, with the west room going out of use whilst floor layers were still accumulating in the east room. The heaps of sand around the walls of the east room, its lack of a central post and its use for bronze working suggest that it was not roofed. Finds. The bronze-working debris in floor layer 233 included droplets, casting waste, including a piece of a clay mould for casting wheel-headed pins (also known as Swan's neck sunflower pins), and also part of a small bronze finger-ring. The pins are typologically dateable to the 6th and 5th century BC by Coles and are found all over mainland Scotland (Coles 1960, 89). Moulds for casting them have also been found in the earliest village at Jarlshof in Shetland (HU30 1). On abandonment, the building filled up with clean windblown sand in what may have been a rapid natural event. The generally rounded rims are similar to pottery from the earliest layers at Dun Vulan. They may be ascribed to the late Bronze Age on the basis of the TL date mentioned. 3. A late Bronze Age warrior élite? Cladh Hallan is the first clear evidence of a late Bronze Age settlement in the Outer Isles, just as Dun Lagaidh is the first hillfort of the period to be identified on the west coast (NH19 2). Like Dun Lagaidh, Cladh Hallan has not produced direct evidence of metal weapons but, as also in the case of the hillfort on Loch Broom, leaf-shaped bronze swords of the same period have been found locally. Two were found some time before 1864 at the bottom of about 10 - 12 ft of peat at Eochar, near the north-west end of the island [8, 9], at about NF/7746; they had presumably been thrown into what was then a loch as offerings. The inhabitants of Cladh Hallan had some high-status objects like the gold- plated lock ring, and a presumably travelling smith made for them (among other things) wheel-headed pins of the same kind as that found near Dun Lagaidh. It therefore seems quite likely that this settlement was made and lived in by a similar warrior élite. Whether there are any strongholds of this period on the island remains to be discovered. Sources: 1. NMRS site no. NF 72 SW 17: 2. Discovery and Excavation, Scotland, 1995, 110; Ibid. 1996, 110; Ibid. 1998, 103; Ibid. 1999, 91-3 and fig. 24; Ibid. 2000, fig. 32, 97-8; Ibid. 2001, 102-4, figs. 41, 42; Ibid. 2002, 121-2: 3. Armit 2003, 39: 4. Bewley 2003, 52: 5. Campbell 2002, 140: 6. Parker Pearson and Sharples 1999: 7. Mulville, Parker Pearson, Sharples, Smith and Chamberlain 2003, 22-3, 28 and 30: 8. Fojut, Pringle and Walker 2003: 8. Anderson 1879: 9. NMRS site NF 74 NE 13: 10. Parker Pearson, Sharples and Symonds 2004. Cladh Halainn is a later prehistoric settlement on the W coast of S Uist. 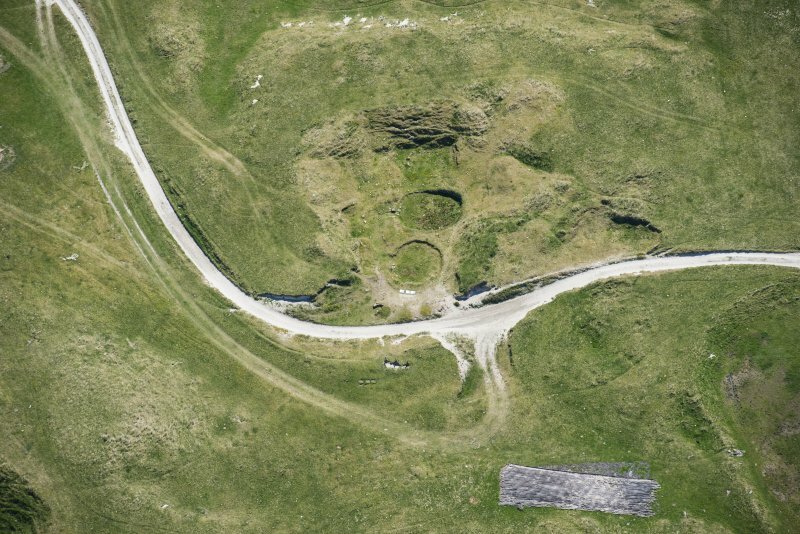 The site consists of a row of conjoined roundhouses, excavated as part of the SEARCH project (DES 2002, 121–2). The excavation revealed that human remains had been interred within each of the excavated dwellings. however, further human remains may lie immediately below the surface of the track. Under the floor of one of the houses, archaeologists made the very unusual discovery of two mummified bodies – male remains, dated to around 1600BC, and a female who died around 300 years later. But the surprises didn’t stop there. Radiocarbon dating of the remains and charred grain on the floor of the house suggests they spent hundreds of years out of the ground before being buried under the roundhouse. The delayed burial is thought have been to be part of a ritual belief or severance to ancestors. Ethnographic studies outside Europe have shown that preserved human remains of prominent people or ancestors were sometimes stored and retrieved for particular ceremonies or festivals. The treatment of the Cladh Hallan bodies after death suggests ancestor worship was also strong in prehistoric Europe. Could it be that these people were important ancestors, leaders, rulers, or prominent in their community for some other reason? The skeletons were still articulated, indicating that skin and sinew were holding them together when they were buried – something not possible in the damp climate of South Uist without some form of artificial preservation. It is thought that the bodies had been preserved in a peat bog shortly after death (it is estimated this would have taken between 6 and 18 months), but not then buried until about 1120BC – some 200-300 years later. After this extended period above ground in a preserved state, they had then been carefully placed under the floor of one of the roundhouses as it was constructed (this is sometimes referred to as a ’foundation deposit’). But a number of mysteries remain. Why was one body made up of different individuals? And why were they eventually buried in the floor of this particular house? Both skeletons were intact, and arranged in a tight foetal position. Intriguingly, the woman had two of her teeth removed and placed in her hands after death. The male remains are even more puzzling – the torso and limbs of one man, the skull of another, and a jawbone from a third. The three had died over a span of 150 years. Archaeologists believe that a community of farmers built this series of small but substantial roundhouses around 2000BC, during the Early Bronze Age. 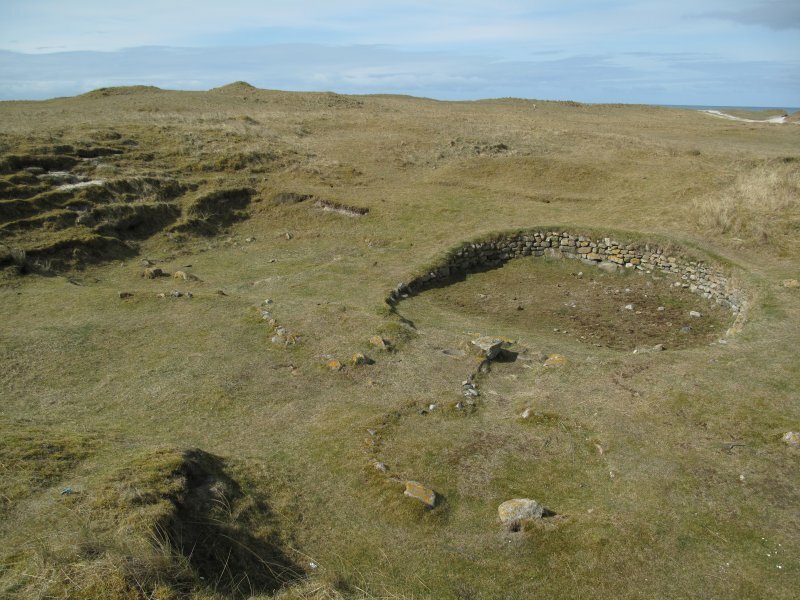 Partially dug down into the sand, this type of building became quite common in the Western Isles during later periods. A large round hole would be excavated before being lined with big stones to prevent it collapsing inwards. The roof would then be spanned, probably using driftwood, before being thatched using marram grass from the nearby sand dunes. An incredibly detailed understanding of Bronze Age life at Cladh Hallan has emerged through meticulous excavation and recording of material from the floors of these houses. We have learnt how food was prepared, where craft activities took place and where the inhabitants slept at night. Bronze artefacts were unearthed, as well as tools for cutting and scraping out of chipped flint and quartz. Their pottery was decorated with fine lines and indentations, known across Europe as Beaker ware. 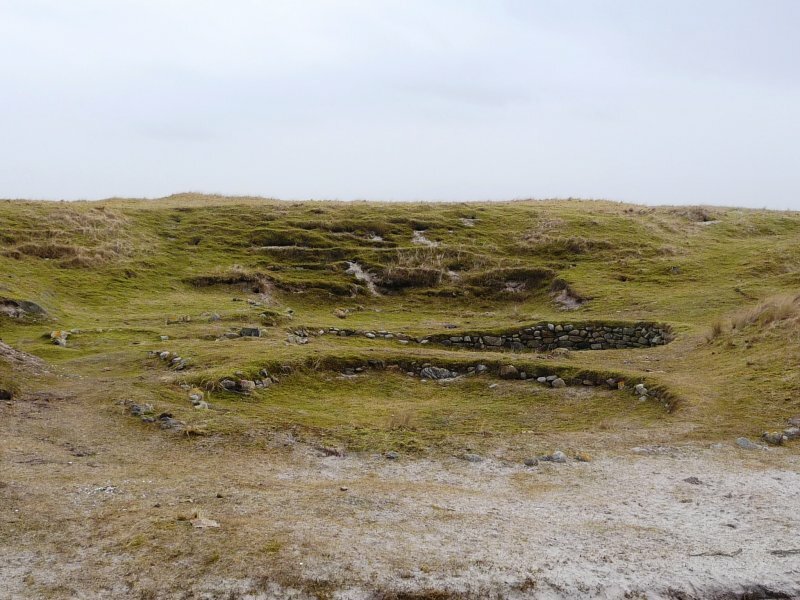 There was also evidence of the community using ash, household waste and peat mixed with the machair sand to improve the fertility of the soil around their settlement, to help grow crops such as barley. Cladh Hallan is located on the Daliburgh Machair on the island of South Uist. The Machair is an area of low-lying arable or grazing land formed near the coast by the deposition of sand and shell fragments by the wind. The machair at various points along South Uist contains a complete cross-section of settlement history from 2000 BC to AD 1300. Numerous sandy hills can be spotted indicating the location of former settlements where the wind-blown sand has accumulated, preserving them for thousands of years. The alkaline nature of this sand has also allowed for a high level of preservation of materials such as bone which, in more acidic areas, would be much less likely to survive. The outline of the Cladh Hallan roundhouses has been restored in stone and can be seen today by following the track out to the Hallan Cemetery.